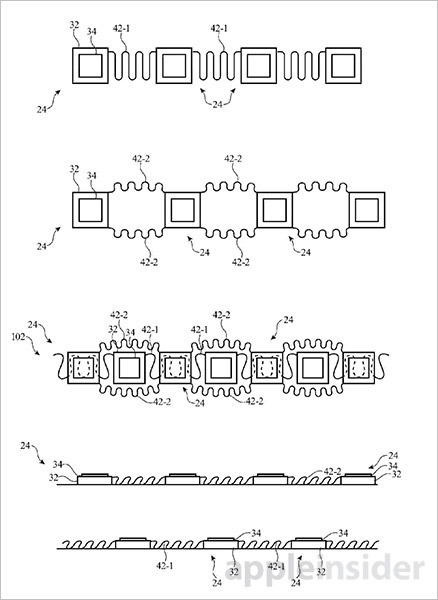 The U.S. Patent and Trademark Office on Thursday published an Apple patent application hinting at the company's plans to build an advanced iPhone, or other personal device, with an exceedingly flexible display. 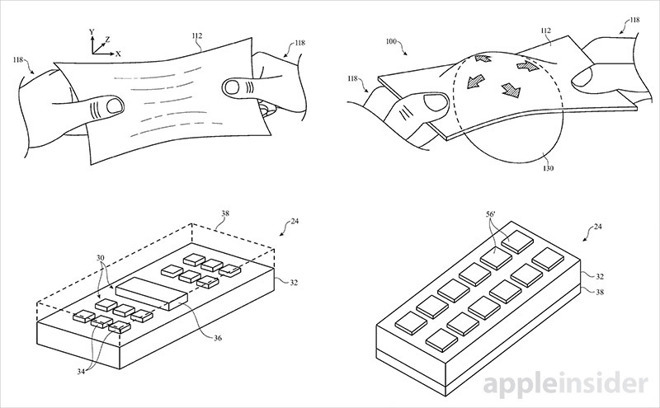 Apple's filing for "Electronic Devices With Soft Input-Output Components" discusses potential solutions for fitting modern LCD or OLED panels, or derivatives of said displays, into a consumer product with a bendable design. More specifically, the invention provides a system of forming a flexible input-output display with integrated sensors and haptic feedback mechanisms from a mesh-like elastomeric substrate layer. Traditional flexible displays, like certain OLED models fitted onto smartphones made by Samsung, rely on a sheet of plastic. 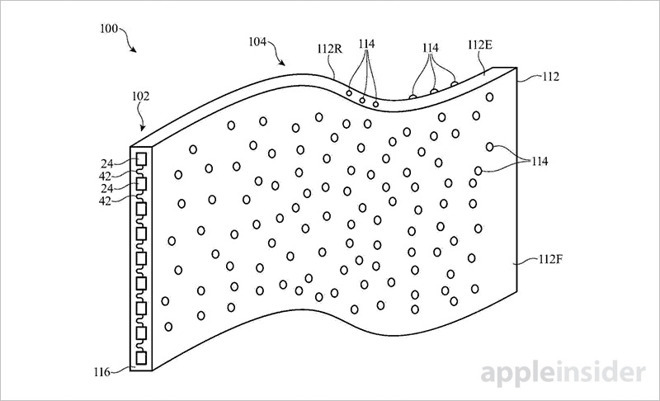 To enhance substrate flexibility, Apple proposes laying down the necessary light-emitting components (LEDs, micro-LEDs and OLEDs), input mechanisms and the conductive traces that form interconnect paths in a grid shape. These paths can be straight, serpentine or undulate up and down to better facilitate flexing. Importantly, the process calls for thinning or complete removal of the underlying polymer substrate layer, leaving a mesh-like structure topped by discrete "electrical units" or "islands." This arrangement is well suited to handling deformations such as bending or stretching in one or more dimensions without cracking or breaking. In addition to being bendy, Apple's display is able to accommodate a range of onboard sensors and other components common to modern smartphones. For example, the document notes the potential inclusion of touch sensors, force sensors, strain gauges, light sensors and more, many of which are already included in iPhone, iPad and Apple Watch. Other embodiments include the use of backlight structures, transparent materials, alternative light-emitting modules, fabrication techniques and other technical considerations. Whether Apple intends to bring this particular invention to market remains unknown, but the company is widely rumored to adopt flexible display technology in a future iPhone model. Beyond general industry trends, flexible OLED panels allow greater latitude in designing aesthetically appealing and functional next-generation devices. Apple can deploy bendable screens to utilize a larger portion of surface space on small format devices. For example, bezels, which are commonly used to hide display control circuitry, might be made a functional part of the smartphone touchscreen. Alternatively, flexible displays could spawn an entirely new class of device that goes beyond the rigid glass and metal monolith designs made popular by iPhone. Future portables with full-face screens might be capable of bending in on themselves like clamshell style folders of the 1990s, for example. Perhaps not coincidentally, Apple is working on that, too. 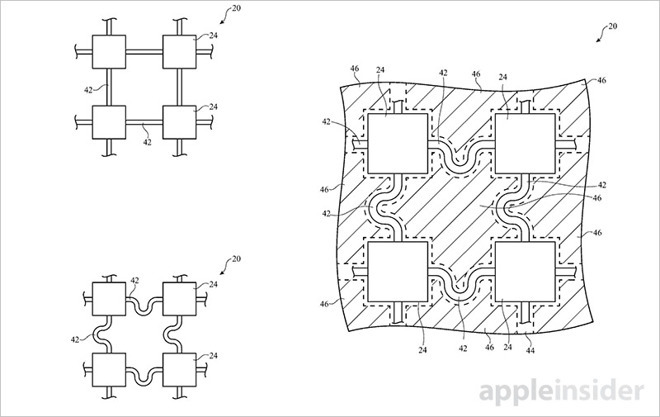 Apple's flexible display patent application was first filed for in October 2016 and credits Hoon Sik Kim, Yung-Yu Hsu and Paul S. Drzaic as its inventors.